Blood stem cells were the first stem cells to be identified. Their discovery in the 1960s marked the beginning of stem cell research. Today, researchers continue to learn from blood stem cells and are working to identify new ways to use them in the clinic. Discovered in the 1960s, blood stem cells (haematopoietic stem cells) were the first stem cells to ever be discovered. Blood stem cells primarily reside in bone marrow and make all the cells found in blood, including cells important for the immune system. Transplants of blood stem cells have become widely used to treat diseases such as leukaemia, anaemia and autoimmune diseases. However, blood stem cell transplants still carry significant risks. Patients are very susceptible to infection for several weeks after treatment and complications such as graft-versus-host disease can be fatal. To make treatments better, scientists are studying the origin of blood stem cells in embryos and what signals control blood stem cells in adults. Studies are examining what causes blood stem cells to malfunction and lead to diseases like leukaemia and anaemia. Researchers are developing ways to make blood for transfusions in the laboratory rather than needing to collect blood from donors and test it for diseases. Using induced pluripotent stem cells to make blood stem cells is currently being investigated to avoid needing to match patients with donors and avoid the risks of unsuccessful matches. Two primary challenges of blood stem cell transplants are the risks of infection and patient-donor cell incompatibility. Both of these are actively being studied. Studies to better understand what signals make blood stem cells and control their behaviour is a slow and labour intensive process. Making blood or blood stem cells in a laboratory from pluripotent stem cells requires researchers to be able to tightly control how stem cells behave to make cells of consistent quality and uniformity. This challenge becomes even more difficult when scaling-up procedures to make large numbers of cells. Blood stem cells are also known as haematopoietic stem cells. Like other stem cells, they can self-renew, or copy themselves. They also produce the different types of specialized cells found in the blood: both red blood cells and the many kinds of white blood cells needed by the body’s immune system. The tree of blood: Blood stem cells are at the origin of all blood cell types. 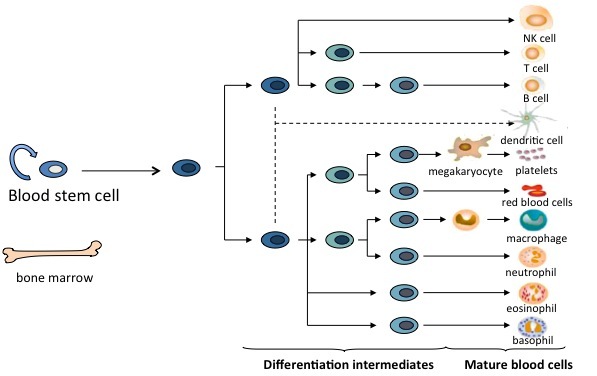 Once a blood stem cell divides, its daughter cells take various differentiation routes to produce different types of specialized blood cells. Specialized blood cells do not live very long, so the body needs to replace them continuously. Blood stem cells do this job. They are found in the bone marrow of long bones such as the femurs (thigh bones), and in the hips or pelvis, the vertebrae (backbones) and the rib cage. They can also be obtained from the umbilical cord blood and the placenta at birth. Blood stem cells need to make just the right number of each type of blood cell to keep the body healthy. This is a carefully controlled process. When it goes wrong, the result may be a blood disease such as leukaemia or anaemia. Blood stem cells are already widely used to treat such diseases. A survey in 2008 showed that more than 26,000 patients are treated with blood stem cells in Europe each year. These blood stem cells come from three different sources – bone marrow, the bloodstream of an adult or umbilical cord blood. Bone marrow transplants are in fact blood stem cell transplants. Such transplants can be used to treat patients with blood diseases like leukaemias, lymphoma or multiple myeloma. After high doses of chemotherapy or radiation therapy, the patient’s own blood stem cells are destroyed. Bone marrow containing healthy blood stem cells is taken from a donor and transplanted into the patient. The donor blood stem cells can then take over the job of making blood cells in the patient’s body. Blood stem cells can also be obtained from the bloodstream. Certain proteins are used to stimulate stem cells from the bone marrow to move into the bloodstream so that enough cells can be isolated for a transplant. These stem cells are most commonly used for treating cancers like leukaemias and lymphomas. Blood stem cells can be isolated from umbilical cord blood after birth. The cells can then be used to treat children with some kinds of blood diseases, such as leukaemia, congenital immunodeficiencies, anaemias or sickle cell disease. Researchers are looking for ways to increase the number of stem cells that can be obtained from cord blood, so that they can be used routinely to treat adults too. Scientists are still learning about how blood stem cells develop in the embryo, how they are controlled in the adult body and what goes wrong in certain blood diseases. But they are also using today’s understanding of blood stem cells to investigate new ways to treat patients. A bone marrow transplant is only possible if a compatible donor is available. The patient and donor must be very carefully matched to avoid immune rejection of the transplant. Even when a suitable donor can be found, there is still a small risk of rejection. Umbilical cord blood does not need to be matched quite so precisely to the patient, but there are not enough stem cells in an umbilical cord to treat an adult. So we need to find alternatives. Researchers are investigating ways to produce large numbers of blood stem cells in the laboratory. They are also developing methods for growing specialized blood cells from blood stem cells, for example to produce red blood cells for blood transfusions. Red blood cells carry oxygen around the body. Patients who lose a lot of blood need to have it replaced straight away by a blood transfusion. There are not enough blood donors to meet patient needs, so researchers are looking for an alternative solution. Since pluripotent stem cells have the potential to make any cell type of the body, they could potentially provide an unlimited supply of red blood cells. It is already possible to make small numbers of red blood cells from pluripotent stem cells in the lab. Now the real challenge is to develop techniques for producing the large numbers of red blood cells that are needed for transfusion. Red blood cells, like other mature blood cells, are short-lived and specialized for a particular job. To cure disease in the long-term, doctors need to transplant something that can keep producing new blood cells throughout the patient’s life: blood stem cells. Scientists are searching for ways to grow a limitless supply of blood stem cells. One possibility might be to collect stem cells from the bone marrow then grow and multiply them in the lab. Researchers are also trying to make blood stem cells from embryonic stem cells or induced pluripotent stem (iPS) cells. 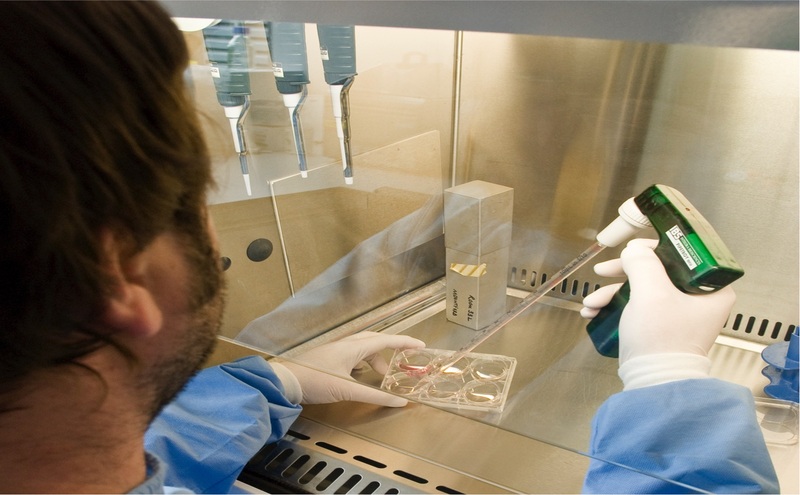 iPS cells could be made from a patient’s own skin and then used to produce blood stem cells. This would overcome the problem of immune rejection. This factsheet was created by Christèle Gonneau. Reviewed in 2014 by Lesley Forrester and Cristina Pina. Reviewed and updated in 2018 by Lesley Forrester. Lead image of blood cells by Anne Weston/Wellcome Images. Blood stem cell photograph reproduced with permission from Taoudi et al. (2005) "Progressive divergence of definitive haematopoietic stem cells from the endothelial compartment does not depend on contact with the foetal liver", Development 132: 4179- 4191. 'Tree of blood' diagram by Christele Gonneau, with blood cell drawings courtesy of Jonas Larsson, Lund University, Sweden. All other images courtesy of Joanne Mountford at the University of Glasgow. Your body makes 2 000 000 red blood cells every second, all thanks to stem cells. Mature red blood cells are visibly red in colour. Small quantities of red blood cells can already be made in the lab from embryonic stem cells.